My family and I stopped in Dubai for a three-day vacation in July on our way to Pakistan from the United States. As I was planning the Dubai stopover, a friend of mine who maintains an apartment in Dubai for his frequent business trips there heard about it, and offered to me the use of his apartment and his driver for the duration of our stay. This friendly gesture proved to be extremely convenient and valuable for us. Not only did the driver meet us at the airport upon arrival, he stayed with us and showed us around the usual places such as Palm Jumeirah, Burj ul Arab, Atlantis hotel and resort, various shopping malls, etc. He also arranged for a desert safari for us. In addition to the tourism, my family and I got a chance to meet an old friend of mine and his family, who have been settled in Dubai for the last thirty years. He heads the sales office of a major European company there. Our Dubai arrival was very smooth. The plane landed at 4AM, about a half hour earlier than scheduled, and the immigration and customs procedure were very quick and efficient. As we came out of the airport terminal building, our eyeglasses were all fogged up by the heat and humidity of Dubai. We had to take them off to look for the driver who was supposed to receive us. He did arrive shortly after, and took us to the apartment and got us settled in there. On our way, we heard the muezzin's calls for the morning prayers from several mosques, reminding us that we were in a Muslim nation. We stopped at a Pakistani restaurant, and picked up a breakfast of desi omelets and paratha and ate at the apartment. After resting for a few hours, we ventured out to the Dubai city mall. As we drove from the apartment, the city appeared to be enveloped in a rather thick haze that the driver suggested was dust. The roads were wide, and we could see many shiny new buildings, and few cranes on either side of the road. The traffic seemed fairly light for a normal business day. We headed to the Mall's food court for lunch. Many of the restaurants were familiar, including KFC, Burger King, Krispy Kreme and Subway, but we decided to go for the middle eastern fare at a Lebanese place. The food was quite good and reasonably priced. Since I needed a GSM cell phone and a local SIM, the driver took me to a phone company outlet, where an Indian gentleman was kind enough to suggest buying at Carrefour at a much better price, which I did. The cell phone was activated within an hour after installing the SIM and I was able to make several calls, including overseas calls. The mall has many European stores selling designer merchandise, along with many small stores carrying all kinds of things ranging from apparel to jewelry, shoes, flowers, toys, electronics and food items. The stores selling expensive European designer apparel and accessories such as expensive bags, shoes and jewelry appear to be particularly favored by the rich Emirati women who are quite fashion-conscious. One could see glimpses of many of them, even though some were covered from head to toe, wearing expensive designer stuff visible underneath their black covers. In the evening, my wife and daughters checked out some of the desi apparel and jewelry stores, and later we visited my old friend's apartment. He had arranged for dinner at a restaurant called Barbecue Delight that offered a delectable buffet with a wide selection including chicken tikka, seekh kabab, nihari, naan, biryani etc. We enjoyed the food and talked about how things are going in Dubai. He confirmed for us what we had heard and observed; the business is significantly down from a year ago, the rents have come down, the real estate prices are slipping, many people have lost their jobs and left the Emirate, some with the keys in their cars abandoned at the airport. It was reported earlier this year that Dubai police have found at least 3,000 automobiles -- sedans, SUVs-- abandoned outside Dubai International Airport in the prior four months. Dubai and other emirates in the UAE have been heavily criticized for their labor laws that badly treat the poor immigrant labor building the infrastructure. In 2007, the New York Times reported that "after several years of unprecedented labor unrest, the government is seeking peace with this army of sweat-stained migrants who make local citizens a minority in their own country and sustain one of the world's great building booms. Regulators here have enforced midday sun breaks, improved health benefits, upgraded living conditions and cracked down on employers brazen enough to stop paying workers at all." There have also been reports of bailout of debt-ridden Dubai by Abu Dhabi recently, when Dubai was unable to honor a $10 billion bond in June, 2009. Another default is likely on a $10 billion bond coming due in December this year. Dubai has a reported debt load of over $80 billion that must be handled even as the property values continue to fall. These issues of debt and falling property prices will continue to be a drag on Dubai’s recovery. However, as the crisis unfolds, Dubai does have an advantage: no other city in the Middle East has the vision or the infrastructure to act as a services hub for the rest of the oil-rich region, which is expected to rebound from this global recession faster than other areas. With $600 billion of foreign exchange reserves and sovereign investments, the United Arab Emirates, of which Dubai is a part, has considerable resources to support Dubai's recovery. Continuing our vacation the next day, we saw more malls including the Mall of the Emirates and Ibn Batoota mall. These malls did not seem crowded. But there were quite a few kids at the indoor ski resort at the Mall of the Emirates. The artificial ski slope seemed to be fairly tame, like a beginner bunny slope at ski resorts in the Sierras, perfect for the curious young ones wanting to explore skiing and snowboarding. 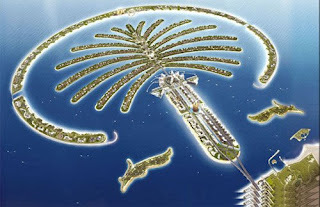 We then went to see the newly built Palm Jumeirah, a man-made island about 5 km in diameter. It covers an area of 600 hectares and was reclaimed from the sea. Once complete, the development will increase the Dubai shoreline by 75 km. We saw a lot of apartments and villas on Jumeirah that appear to be empty. Many are said to have been bought by foreign, non-resident speculators who who were hoping to make a quick buck by flipping these properties prior to the bubble burst. While most environmentalists believe Palm Jumeirah is a disaster, it is a great engineering feat and aesthetically quite pleasing, particularly the Atlantis hotel and resorts are beautiful. There is a very impressive aquarium inside Atlantis that features live sharks. But there are persistent concerns that most of the reclaimed development will come under water as the sea level rises with global warming later this century. We headed out to Sharjah for the desert safari in the afternoon. We were driven in a Toyota Landrover, and as we approached the desert, the driver partially let out the air from the tires to get better traction on sand. It was quite a thrill ride over the sand dunes and felt much like a roller coaster ride. The driver drove up to the top of the sand dunes, and then rapidly came down the other side, slipping and sliding all the way. Following the sand dune adventure in Sharjah, there were camel rides, dinner and belly dance at a camp in Dubai. The driver explained to us that the camp is located in Dubai because the Emir of Sharjah has forbidden drinking and dancing in his emirate. It was an enjoyable few days for us in Dubai. It's an emirate like no other, allowing night clubs to operate along with its many mosques. In spite of its current economic difficulties and concerns about labor practices, it has the potential to come back strong because of its multiple advantages, such as many first-world businesses, excellent infrastructure and its ambitious leadership. It represents a place where the average people of South Asia and the Middle East can get a taste of how the other half in the first world lives, and hope to aim higher to improve their own lives in their native lands. Dr R. Srivastava who works at a reputed hospital in Dubai said she can’t believe her PhD in quality management from Midtown University is good for nothing. She spent Dh40,000 on the ‘course’ between 2011 and 2014. “I saw Midtown’s advertisement on Facebook and enrolled for the course hoping it would enhance my career,” Dr Srivastava told XPRESS. An IT manager at a software firm who forked out Dh18,000 for an online computer networking degree from Edgebrook University is equally gutted. “This is heart-wrenching. Would you believe, I even threw a party to celebrate my graduation. I had been saving for years for this course hoping it would help me get a promotion,” said the Egyptian. Not everyone could handle the truth. “What do you mean my degree is fake?” demanded Ali, vice-president of a retail firm, when XPRESS called him about his MBA degree from Rochville University. “My degree is 100 per cent genuine. It’s duly attested by all relevant agencies and I have been using it for years,” he said angrily before disconnecting the line. Ali may want to know that his fellow alumni at Rochville was a dog. The year Ali got his degree, the university also awarded an MBA to a canine named Chester. This happened when an undercover Singaporean journalist enrolled her pub for the university’s online MBA programme. The dog’s degree came in a parcel couriered from a Dubai address. 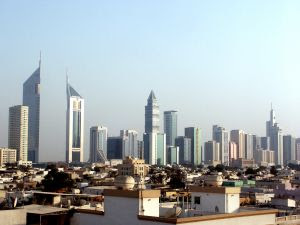 An insider at AXACT said the UAE was their most lucrative market after the US. “Hundreds of school dropouts from the US bought our degrees to land jobs in Iraq and other Middle East cities. The UAE was key to our operation. We funnelled nearly Dh288 million from here to Pakistan in the past four years,” the man said, citing anonymity. He refused to give details.